Previous Article: What is TOEFL? 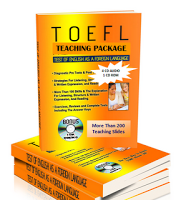 PBT-TOEFL is the first type of TOEFL Test released by ETS. PBT-TOEFL system still uses paper and/or sheets of paper and answer sheets that must be filled with 2B pencil. A score range of PBT is 310-677. CBT-TOEFL is the second form of TOEFL TEST replacing PBT-TOEFL. CBT-TOEFL doesn't use paper any more, but computer. All test materials are stored in computer and the Test is directly done in computer, too. CBT was firstly issued in 1998. A score range of CBT is 0 - 300.
iBT-TOEFL or also known as Next Generation (NG) of TOEFL TEST is the latest form of TOEFL Test issued by ETS. ETS did many changes in the test format and system. iBT-TOEFL uses computer media connected to Internet in Test process. Thus, the test participants can directly be on-line with the ETS and the answer test questions are also on-line, too. A score range of iBT is 0-120.